This classic picturebook is a memorable rhyme which links together traditional English nursery rhymes. The beautifully detailed illustrations provide a wonderful visual I Spy game of spot-the-character, too. Read aloud Before you start reading the book, look at the cover together and identify the objects shown. What clues do they give to the story? Look at the end papers for more clues. As you go through the book, children can ‘spy’ the objects in the illustrations on each page. Children can look for clues in the pictures to help them. Talk about the pictures together, searching for the characters on each spread. Look together at the end papers to find the different characters and events of the story. Children can choose favourite pages to look at again and talk together about what they see. A grandmother reads Each Peach Pear Plum to her granddaughter. Children can retell the story rhyme using the pictures, with a few prompts to help them if needed. 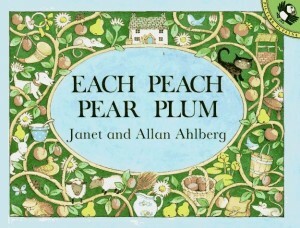 Read the nursery rhymes and songs featured in Each Peach Pear Plum and others. There are many collections available from libraries and on line, some with CDs. Encourage children to learn their favourites by heart. Make simple finger puppets of all the characters in the story using paper, card, glue or tape and felt pens. Use them to retell the story.